While Zion National Park is open year round, facility hours and shuttle schedules change depending on the time of year. If you’re looking to plan a last minute trip to Zion Canyon during this winter season, here are a few things to consider. Like any other time of the year, be sure to check up on the current conditions of Zion Canyon before heading out on your adventure filled day! Current conditions can be checked by visiting the National Park Service online. Their Current Conditions page is constantly being updated with any weather/conditions alerts for the area as well as updated information on trail conditions. Be sure to remember that after recent storms, most all of the higher elevations trials will still have snow and ice along their paths. If you are wanting to venture these trials, traction devices are highly recommended! Shuttle System: Is it up and running? During the winter season, the Zion Canyon and Springdale Shuttle services have stopped operating, and won’t open up until the early spring. While the shuttles aren’t in operation, private vehicles are allowed to drive into Zion Canyon via the Zion Canyon Scenic Drive. Finding parking will be challenging along the scenic drive, so be sure to look for designated parking areas and avoid parking alongside the shoulder of the road! With the shuttle not being in operation, be sure to check the Current Conditions page for information and updates on road conditions. In addition to the page offered by the National Park Service, they also offer updates on Twitter. For information on the roads leading you to Zion Canyon, feel free to call 866-511-8824 for updates on those road conditions as well. Zion Canyon Scenic Drive: Accessible by private vehicles until early spring of 2017 when the Shuttle System will be up and running. Zion-Mt. Carmel Highway: Clear road with icy spots in the shaded areas. Kolob Canyons Road: During the winter, the Kolob Canyons Road closes frequently due to harsh weather conditions. For current conditions call the Kolob Canyons Visitor Center at 435-586-9548. Kolob Terrace Road: As of Dec. 1, 2016 the Kolob Terrace Road is clear from the base of the road up to Lee Valley. From Lee Valley to Black Canyon there are patches of snow along the road. Black Canyon has roughly 6 inches of snow; 4 wheel-drive/high clearance vehicles are required for this area. The Lava Point and West Rim roads are closed. 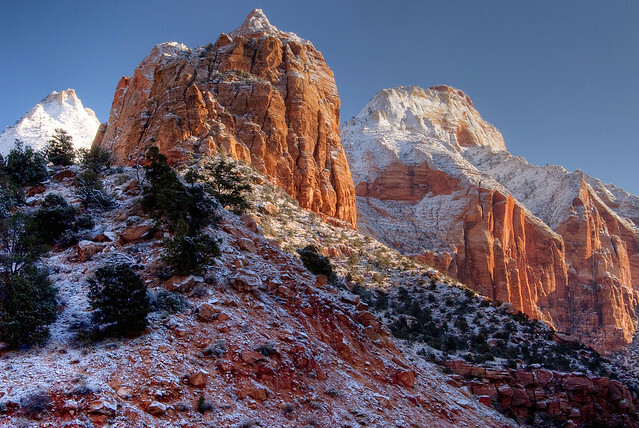 Don’t let this winter season scare you away from experiencing the beauty that Zion Canyon has to offer! It doesn’t snow in the area often, so it is a sight that most will not get to experience. The stunning red cliffs contrasting with the purity of a fresh, white snow are a view worth making the trip for.